Last night as I was browsing through the Iranian news websites, or what is left of them rather, I came across the pro-Ahamdinejad Fars News, which reported on the commemorations held in Isfahan for the 'great martyr of Shiite Islam', Edoardo Agnelli. Somehow the name rang a bell but I was relating it to football not martyrdom and Shiite Islam. Something in the back of my mind was reminding me of a football match years ago when everyone was asked to stand in silence before the match started because of an unfortunate death of someone related to Italian football. 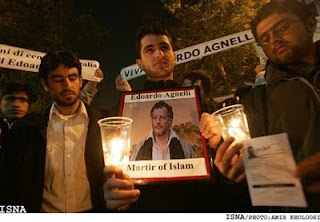 As I read the news further, I realised that my memory hadn't entirely failed me, Edoardo Agnelli was indeed the son of Gianni Agnelli, the wealthy Italian industrialist and the owner of the Juventus football club, but what was all this 'Great Martyr of Shiite Islam' I wasn't aware of? So thanks to Google, I searched for more stuff on Martyr Edoardo and came across a documentary film made by the Islamic Republic, which I had not seen before. The documentary was as expected. There were lots of negative emphasis on Jewish and Zionism connections. Great Martyr Edoardo's mother was Jewish, all his doctors in the hospital were Jewish/Zionists and the next chosen heir whom 'Martyr Edoardo' vehemently opposed was also his half Jewish nephew from his sister's first marriage to a Zionist and also his death was engineered by the Zionists. All good standard stuff as you would expect from the Islamic Republic. There was one huge mistake however that I stumbled on. During the film, his Iranian friends, from the Islamic Association of Graduates in Italy, talk about Martyr Edoardo. One of them Hossein, who now lives in Madrid, said how Edoardo studied all religions fully and in depth before choosing Shiite Islam as the true path. 'He had the time and the money to study all religions and chose the best one' Hossein from Madrid claims in the film. What a privillege indeed, imagine if God had given us all that luxury of time and money to study all faiths and religions in detail so we could choose the correct one and not end up in hell simply because we didn't have the resources to fine comb through all these spiritual products and choose the 'correct' one. According to the Muslim belief however, Jesus was not crucified. Someone similar looking to him got crucified, Jesus lived on and propagated the call of God in secret until he died later. How did Edoardo convert to Islam not knowing this fundamental point? And I also thought whose side would Edoardo be on if he was alive today? Would he be on the side of the Green Movement? In which case Galloway would have had a field day, referring to the protesters as 'Rich North Tehran Kids and Italian tycoons' or would Edoardo be on the side of Ahmadinejad's messianic junta and be another confused rich kid who couldn't recognise what working class was and imagined Ahmadinejad had the support of the working classes in Iran? This site, esfahanfarhangi also reports the commemoration but also mentions someone called Rafiuldin(?) from Communist Youth branch - doesn't say from which Communist Party - who has also, in the footsteps of Edoardo, converted into Islam. I presume Rafiuldin, the ex-Communist youth, will also be martyred soon somewhere by the Zionists. I am very concerned about the level of anti-Semitic propaganda that is being forced down Iranian people's throat. It's worrisome. No dont worry the more they try to force feed people the more people will throw it up. Writing from Italy: OK the Iranian presentation is slightly over the top, but speaking as an Italian I don't think foul play in the death of Edoardo Agnelli can be ruled out - especially in a country such as this, with its near-endless post-WW2 list of "inconvenient" businessmen, journalists etcetc who ended up "suicided" or "accidented"... the most recent of whom is Adamo Bove... like Edoardo, he too was found dead at the foot of a motorway bridge. The best-known of the series in the UK is Roberto Calvi - the Vatican-linked banker left forlornly dangling under Blackfriars Bridge. Other suspicious "suicides" generated by the darker interweavings of Italian big business and politics are those of Sergio Castellari, Gabriele Cagliari, Raul Gardini... the Enimont scandal alone generated no less than 12 suicides, of which at least 4 were "suspicious"! So in Edoardo's case, no real need to lay the deed on Mossad: our own spook-world and/or mafia-zone has more than enough expertise without need of outside assistance. In a recent book on Edoardo's death - with preface by judge Ferdinando Imposimato, one of Italy's top prosecutors - journalist Giuseppe Puppo has examined the least-convincing aspects of the suicide verdict, of which there are many - way way too many to list here! But in his view the most likely motivating factor would have been straight greed-and-power lust on the Kissinger-linked Elkann side of the Agnelli family tree - in quite possible/probable conjunction with "Atlanticist" unwillingness to see the wealth and power concentrated in FIAT fall into the "dubious" hands of a man as idealistically unworldly as Edoardo... R.I.P. P.S. re the "gaffe": Edoardo Agnelli had studied comparative religion at Princeton so was no ignoramus, but he was by temperament a mystic not a dogmatist - his Islam was essentially that of Rumi. Nitpick: Edoardo's mother wasn't half-Jewish she was half-American, non-Jewish variety. Other half was from the princely Caracciolo family of Naples. You ask who-if-anyone would Edoardo support in Iran's current turmoil if he were still alive. My reply: with 99.99999% certainty, I think his hopes would be with Karroubi. The reason I wrote this post was exactly to show how over the top the IR produced documentary was. I am surprised they didn't even notice the gaffe and included the interview with Manifest in the documentary. Do you know anything about Edoardo's meetings with the Supreme Leader? Only what the Iranian sources say, there's no independent "Italian source" on those years, and the Agnelli family have a reputation for discretion. The Italian press reported the Iranian "revelations" on his repeated visits to Qom in the late seventies and early eighties as true, also accepts his conversion as probably-true - and as far as I know, these reports have never been denied by the Agnelli family. But no details are available here on the content of his meeting(s?) with Khomeini: probably little more than an exchange of pious platitutes? It seemst the only point you have is that in the interview shahid eduardo mentions about jesus's crucifiction as a painful event, this is because he is asked about jesus, and he answered based on the believes of the one asking...but soon after mentions that he has chosen another path! I dont know what you say... i just cant see any better system in the world.. i know it is not the best now, and it needs time to fix a lot of things that the previous regimes and super powers imposed on the people... but Iranian clerics freed their people, and people still support this system... i dont know what you call millions of people marching on 22 bahman, revolution's day... or high rates of voting... but these are things that exist, whether you choose or choose not to see them. I hope you can look differently to Iran (governement and ppl since they are one) and try be more truthful and not judgemental... and refraining from refuting things without further inspection... god bless you all.